In 1957, Juan Manuel Fangio wrote the following about the Aurelia. Its an unusual and rather interesting take on the car by what was, all things considered, possibly the finest racing driver of the time. "Mate is an exciting and strengthening drink. All men who have worked hard for the greatness of my far-away country have drawn energy from its stinging and warm lash. The souvenir of mate, rich of beloved familiar traditions suggests to my mind a comparison I consider very apt for the car I'm going to speak of. 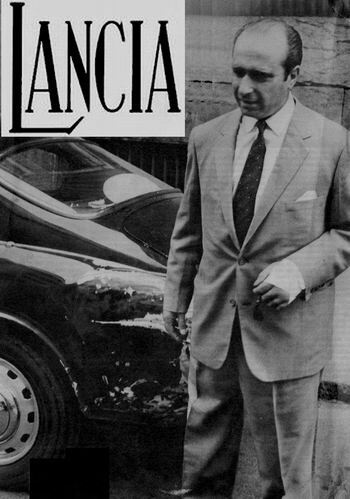 What I mean is that the Lancia Aurelia G.T. is exactly like a cup of mate: it inspires confidence, a sense of security and elation, that subtle undefinable elation which springs from a perfect being. It actually is a car in which impetuosity, common sense, imagination and daring are beautifully blended. The Lancia 2500 B 20 is the car we dream of having built if we had been engineers, if we were able to give shape to the wishes which cross our minds, maybe during a long journey. All the most admirable virtues are grouped in the Lancia Aurelia G.T., mild as a lamb, if necessary as lithe as a panther, as tough as the camels who manage to cross the desert chewing a small morsel of food, it's a smart, fast, impressive car. You can use it to dawdle up and down the streets of Rome of the French Riviera, you can comfortably go from one town to another on business, but the moment you wish it to do so it becomes a sports car, marvelous on turnpikes and capable of amazing performances if one feels like racing fast. And what couldn't I say about its lightness, the perfectly astounding roadholding and the beautifully efficient brake system. As I have said, the Lancia B 20 is like a cup of mate, or, if you should prefer a more mediterranean comparison, like one of those classical wines which Italy's sun renders so mellow. Personally I love those wines, which enhance the heartiness of the land so similar to the one where I was born."